Little Blue Tower ~ Welcome, fellow Traveler. Wander into the art of *Jennifer De La Torre*: "I ain't cryin'..."
A special thanks to @magraphx for the Bethyl request with a reunion theme. 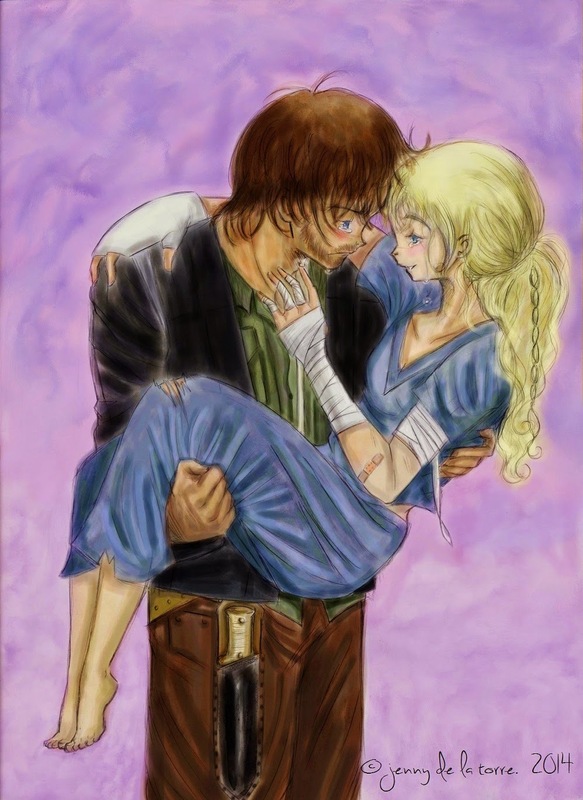 She wanted my version of what Beth and Daryl's reunion will be like in Season 5 of the Walking Dead---and here it is! I saw the trailer for Season Five, and Beth was wearing scrubs and had a cast on her hand, so there will be some injuries sustained during her ventures away from the protection of her group. But Beth's a tough cookie, so she'll work out a way to escape from her predicament. I'm hoping Beth will have picked up enough grit from Daryl to tough it out at the Hospital where she appeared to be held hostage. I imagine at the climax of her grand escape, she would've done most of the work of fighting off Walkers and Daryl only shows up at the last minute to lend a hand. Daryl: "I ain't cryin'...Just got some dirt in my eyes, okay?" Beth: "Whatever you say, Mr. Dixon." Oh I just LOVE this!!!! It doesn't matter whether you're a Bethyl 'shipper or not. It's just what we want to see, right? You are so talented, Jenny. I wish I had more followers JUST so more people could see your work! Thanks for doing this one for me. That's TWO! Wow! #SoVeryHonored. I really want to order a print of the ones you have so far. Let us know when you get to that point, k?